Still here? Good, because Proven Lands looks freakin’ awesome. That’s the work of a small team working for eight months. Before you get disappointed that it’s not everything they describe, they’re working on a complex system-led game and that’s often difficult to show without extensive play – and that’s just not possible till later in development. Look at games like Maia and Satellite Reign, two sandbox games that took more than a year’s development to show how the systems begin to lock together. With that in mind what you’re seeing is a game that lets you “[e]at, drink, chop trees, destroy stones and kill enemies. Enjoy an endless procedural terrain with 30+ chunk types (desert biome only yet). Fight hunger, thirst and diseases. The number of crafting and consumption items is limited, as the core engine is/was more important. At the core of Proven Lands is the idea of making game based on hard science. Not just “sailor soaps with pirates and monsters that just happen to be in space.” Now, I like sailor soaps and don’t like to hear them knocked but when the alternative offered is one where you “assume the role of an explorer and learn about real science (like about history in Sid Meier’s Civilization), within reason for a sci-fi game” then I can be convinced to reconsider my position. The engine they’re working on is built to allow modders to easily turn the science fiction setting into anything they like and still have it procedurally generate a world. “Every planet consists of chunks, chunks consist of modules, and modules consist of items, quests, creatures, aliens, villages etc.” They’ve drawn up concepts of recreating the whole thing as a fantasy epic. Alien worlds are populated with tribes of indigenous creatures and a functioning ecosystem. They’ll hunt, be hunted, trade, and will resist your incursion into their territory if they see you as a threat. As in Maia, you’ll have to maintain the mood of your explorer: “A mood and trait system makes your character less predictable. A wound left unattended might lead to fever, which could in turn lead to mental instability or death.” Your character will also have ambitions to certain goals, they’ll become depressed if these aren’t achieved. As in Don’t Starve, you can build machinery that will mechanise your tasks. You can set ore miners, drills, and oxygen generators. Farms will be vital for gathering food, too. There’s crafting as well, because everything has crafting nowadays. The RPG elements come out through a class and skill system. The classes are different from your average mage, warrior, and paladin – your basic class is a fork lift operator. Skills, too, differ: biology, chemistry, and engineering will guide you in your crafting, analysis, and abilities. There’s a full weather system and day/ night cycle. Both carry their own threats. The weather can also result from your actions: clearing a forest can lead stronger winds, for instance. Finally, on this huge list of features, is one of the finest. You can have a pet space cat. It comes with its own space suit, too. This information dump is all preamble for a Kickstarter campaign that launches later today (and I’ll update this post with the link when it goes live). 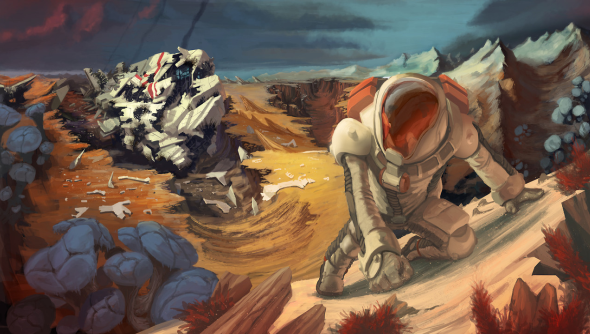 However, unlike most Kickstarters, Proven Lands will launch with a demo. There’s even more information about the game and how it will run over on the developer’s site.